In His original form, Lord Krishna appeared at mid-night, Sravana Krishna Astami (Ashtami ended in evening on 17th June and it was navami but rohini nakshatra during time of birth) from the heart of mother Devaki as four armed Vishnu so that His father and mother could understand their son was the Supreme Personality of Godhead. Vishnu Purana says that it was a dreadful night with heavy rain and violent wind. As soon as he appeared, Lord Krishna advised Vasudeva to carry Him across the river Yamuna. Ananta Naag with expanded hoods protected Lord Krishna and Vasudeva from torrential rains sent by the demigod Indra. Padma Purana (Pages 2112-2125) describes about the Foot Prints of Lord Sri Krishna. During Vraja Leela, Krishna killed many demons, Liberated Nalakubara and Manigriva from tree form, saved cattle and people from violent rains by hiding them in a cave of Govardhana Giri. At that time Krishna was aged 7 years 2 months 10 days and Govardhana Giri incident happened at night of 28 August 3222 BCE. At the end of Vraja Leela, Krishna decided to enter Mathura and put an end to atrocities done by his maternal uncle, Kamsa. 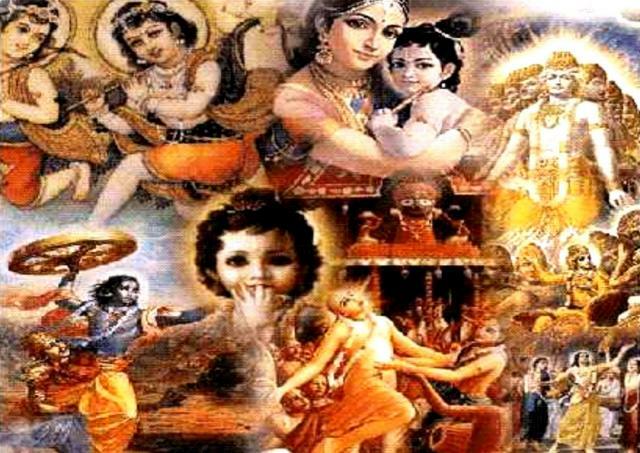 On 14 December 3218 BCE (Siva Ratri), Krishna killed Kamsa and started his Mathura Leela at age of 11 years 6 months. Siva Ratri used to occur 2-3 months earlier in those days, compared to present, due to shift of Solstices and Equinoxes over past 5000+ years. Second among Pandavas, Bheema slained Jarasandha as per the direction given by Lord Krishna. The dual fight between Bheema Sena and Jarasandha started on 17th September 3154 BCE and lasted for 14 days and nights. On 11 February 3153 BCE, at the age of 75 years and 8 months, on Chaitra Poornima, Krishna slayed Sisupala during Rajasuya Yaga in front of all kings. On 2nd May 3153 BCE, Pandavas lost game of dice to Kauravas and left for exile in forest. Sri Krishna met them before they leave, took blessings of Yudhishtir and Bheema, hugged Arjuna, blessed Nakul and Sahadeva. This proves that Yudhistir and Bheema were elder to Krishna, Arjuna was almost of same age as Krishna, Nakul and Sahadeva were younger. On 7 May 3140 BCE (Ashada Sukla Saptami), Pandavas completed their 12 years of forest exile and 1 year of hidden exile period. Arjuna disclosed his original form to Uttara Kumara. On 15 May 3140 BCE (Ashada Poornima), They appeared in court of Virata King. Lord Krishna was 89 years old and Arjuna was 88 years old on the 1st day of Mahabharata War. on 10th day of war, Bheeshma was put down on a bed of arrows by Arjuna. 3 days later, Arjuna’s son Abhimanyu was killed in Padma Vyuh, planned by Dronacharya. Kurukshetra war ended in 18 days with death of Duryodhana. On 5 December 3140 BCE (Magha Sukla Ekadasi), Bheeshma revealed Vishnu Sahasra Namam to Yudhishtir and left his body. Two months later, on 5 February 3139 BCE (Chaitra Poornima), Aswamedha Yagna was started by Yudhishtir. 37 years later, Sri Krishna was shot by an arrow of a hunter on his feet on the thursday evening of 23rd January 3102 BCE. He left his physical body on on 24th January 3102 BCE at 02 hours 27 minutes 30 seconds. The next sunrise was on Friday, with moon in Aswini Nakshatra, tithi (lunar day) being Suddha Padyami (sukla pratipad or first day of lunar month) of Chaitra Maasam (lunar month) in Pramādi named year. This date is 18 February 3102 BCE according to Julian Calendar. After exit of Krishna, his race, Yadavas fought among themselves and everyone died except Krishna’s grandson Vajranabha. Sri Krishna was on this planet for 126 years, 8 months.